Take a trip back in time – to a time when the streets were a little dirtier but a little less congested. When industry was just starting to take off and everyone knew their neighbor. Back in the early part of the 1900s, London was full of dirty chimneys that needed to be cleaned. This issue created the job of chimney sweep, which became a career for only the bravest of souls. Why did it require bravery? Because sometimes these men would have to climb into a chimney to scrub it clean. And that presents a whole list of potential hazards: getting stuck, getting burned, falling, etc. But while they did this dangerous job, they would always whistle while they worked – perhaps to keep their minds off of the dangers they faced. 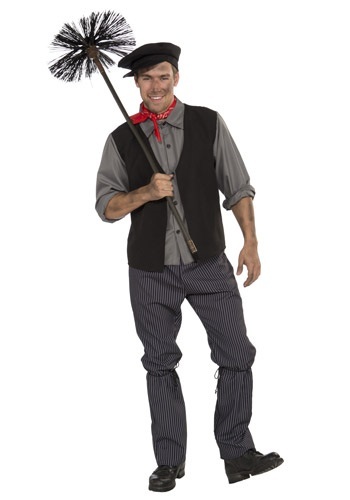 Now you can become one of these happy men covered in coal in this chimney sweep costume. This costume comes with everything you need to get started as a chimney sweep (though I don’t think they are in as much demand these days). The broadcloth shirt has buttons at the cuffs as well as in the front. The vest has a black interlock back with vest panels sewn to the front. The pants have an elastic waist for a comfortable fit and they have a classic black pinstripe look with ties around the knees to keep the soot from getting too far up your pants! Top off the traditional look with the red bandana scarf and black cap with stiff bill – a signature of most chimney sweeps.